Brawn GP was the legacy of a hugely expensive project formerly owned by Honda who had also elected to buy the team from the well established BAR who in 1999 had bought the team from Ken Tyrell. This year (2012) is the third iteration under the Mercedes marque which as a project was supposed to bear fruit as a manufacturer in its own right rather than just be an engine manufacturer. (Just as its previous owners Honda were looking to do) The trouble is always one of transition, time and of course money. Lets look a further back down the line to see how Mercedes current struggles can also be attributed to the past and where they are going to go from here. 2009 was a difficult time for the Brackley based team, on one hand they were winning races and taking the plaudits for building a fantastic car but on the other hand they were restructuring and losing staff to fall in line with the loss of Hondas money and support. In 2008 Honda had realized their car was a dog and switched their focus early to the RA109/BGP001 knowing a new set of regulations gave them a blank canvas on which to base their design. They also accrued some of the team that had been working within the Super Aguri team that had folded in 2008. This was believed to be pivotal in Honda's design approach for the 09 car with the Super Aguri crew rumoured to have bought the DDD concept to Ross Brawns attention (whilst others who left Super Aguri made their way to Toyota and Williams). Honda threw resources and money at the 09 contender although the Japansese marque will never be remembered for the success as Ross Brawn the man who lead the buyout had his name above the door. In fairness to Honda they didn't simply withdraw from the sport but looked for another source to continue their work and keep their employees in a Job. Several avenues were approached but eventually it was to be Ross himself who would take the the team on. The KERS technology was not passed onto the Brawn outfit and/or would have been difficult to implement with the Mercedes engine due to the crank position, cost and purely timing, KERS wasn't possible for the team to introduce in 09. As other teams struggled to utilize their own KERS systems Brawn were able to move ballast around their car but mainly loaded their bib/tea tray area with ballast echoing the weight distribution ethos that the RA109 equipped with KERS may have had. KERS packages in 09 weighed around 30KG's which is a substantial amount of weight when you consider being able to put this wherever you like in the car. The likes of McLaren & Ferrari had to place their heavy systems in certain places to utilize cooling and weight distribution. It turned out that Red Bull would be Brawn GP's closest rival during 2009 with Brawn leading the charge from Australia and the DDD being the coup of the season finding a loophole in the regulations relating to diffuser overall height and using a section above the starter hole to create an additional deck in order to create more diffuser volume. This was much to the frustration of all but Williams and Toyota who too had similar designs and interpreted the rules in much the same way. Ross Brawn as part of the Technical Working Group (TWG) had throughout the draft stage of the technical regulations for 09 pointed out that the area should be looked at due to the potential it possessed to create downforce. He later argued when the teams tried to retrospectively ban Double Deck Diffusers 'I told you so'. The ruling by the FIA to allow DDD's was a huge frustration to a lot of the teams as they knew the lengths that would need to be taken to integrate it into their own cars. The development and implementation of DDD's would take several races and lead to a total shift in the development path most teams would need to take for the season. However it was clear that the BGP001's diffuser was the silver bullet and needed for the fastest package. Red Bull were seemingly the most frustrated having designed what was essentially the quickest non DDD car. Adrian Newey's bug bear was not that he hadn't come up with DDD it was that he could neither get it banned or quickly adapt his RB5 to have it, due to them adopting pull rod rear suspension. Whilst the Red Bull team poured resources into integrating DDD the Brawn team just tried to stay consistent as they couldn't afford the massive cost of a development race and perhaps capitalized on the change from Bridgestones grooved tyres to a more traditional slick tyre whereas others struggled. 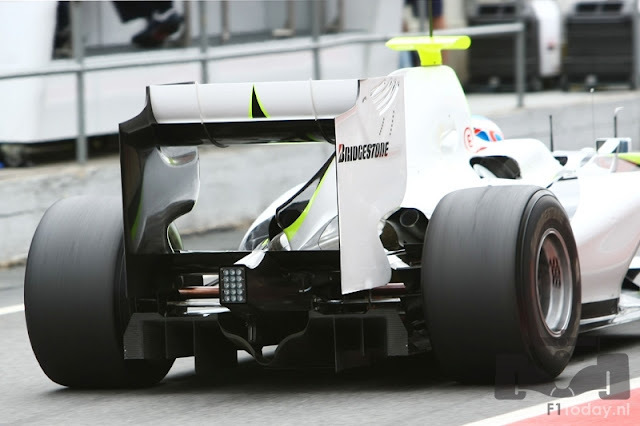 Throughout 09 Brawn had realized that the high chassis / nose / suspension of the RB5 was worth pursuing for 2010. They ran a sight bar / nose ridges to test during Free Practice sessions in 09 in order to assess whether this was the right design process to follow. It's difficult to know from the outside how much effort Brawn had to sacrifice on their 2010 car in order to win the 09 championships. 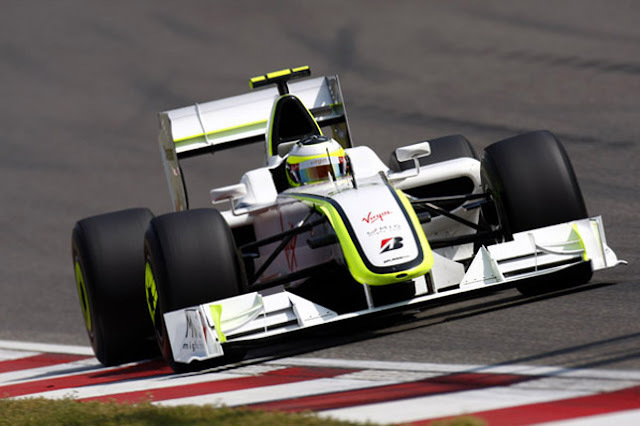 Mercedes decided to purchase Brawn GP but the announcement wasn't made until after the 2009 season had concluded. 2009 had been a hard fought battle with Red Bull and although the team took the title, it had come at the expense of balancing the development of the 09 car further into the season than perhaps was really wanted. The WO1, Mercedes first car in F1 since the 50's was flawed for many reasons although the Brawn GP team had been world champions in 09 they neither had the resources or money to contest the battle for 09 and produce another championship winning car for 2010. When design focus was needed to be placed on the 2010 car during the 09 season both Jenson Button and Rubens Barrichello were at the helm of the BGP001 neither of which drove in Mercedes first season compromising the W01 with traits that perhaps their new driver line up of Michael Schumacher and Nico Rosberg wouldn't like. Michael returned to the sport in 2010 after a 3 year absence in which time he spent the first year as an advisor to Ferrari and continued his motorsport journey on two wheels until at which point he had an accident and injured his shoulder. It was afterall this injury that had stopped his return for Ferrari in 09 for the injured Massa at Ferrari and reignited Michaels passion to be in F1. The DDD diffusers that were the catalyst for Brawn GP's success in 09 were already now fully integrated into the lead teams packages, aided by Exhaust blown diffusers some of the teams now had a huge chunk more rear downforce than the W01. The front tyres were reduced in width from 270mm to 245mm in order to remove some mechanical grip from the front of the cars. A new points system and qualifying process was bought in to both balance the larger field and add further entertainment for the fans. Refuelling would also be excluded. This would see teams carrying around 160-180 Litres of fuel from the start of the race rather than the 70-90 Litres they carried in 09. This in itself required a major rethink in order to balance the requirements of qualifying and the race and selecting wheelbase/weight distribution correctly would give one team more of an advantage than it's competitors. The 2010 season saw all the teams agree on an exclusion of KERS due to the heavy costs involved for the 3 new teams entering the sport. The largest changes from the BGP001 to the WO1 came in the form of the higher ridged nose/bulkhead as I alluded to earlier that the team had taken a cue from Red Bull and in a latter upgrade a blade style roll over hoop with twin airbox entries either side. It was McLaren who stole the limelight in regard to innovation for 2010 with their F Duct system which reduced drag when the driver placed his knee/hand over a cockpit aperture moving airflow normally designated for the engine cover exit and instead blowing the rear side of the rear wing plane via the shark fin style engine cover which was attached to the rear wing plane. All teams realised that the device was a very clever interpretation of the rules and set about designing their own variant. This turned out to be a protracted battle as McLaren's tub was designed with this in mind whereas the other teams were not. 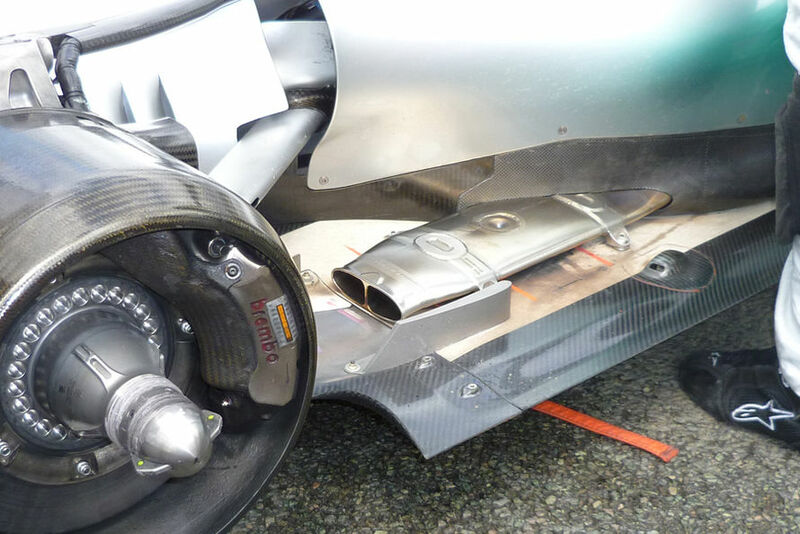 Mercedes decided that they couldn't effectively develop a close loop (driver operated) F Duct system into their package without further compromising their current aero (due to the low slung blade roll hoop) and so set about adding an open loop (passive) rear wing drag reduction duct. They teased everyone at first with a loop that went from the main plane to top plane but it would appear no other ducting lead from other areas of the cars to this section. The design they eventually used was remarkably similar to a design that McLaren ran in Monaco 2009 who cited this to be their original inspiration behind the current F Duct. 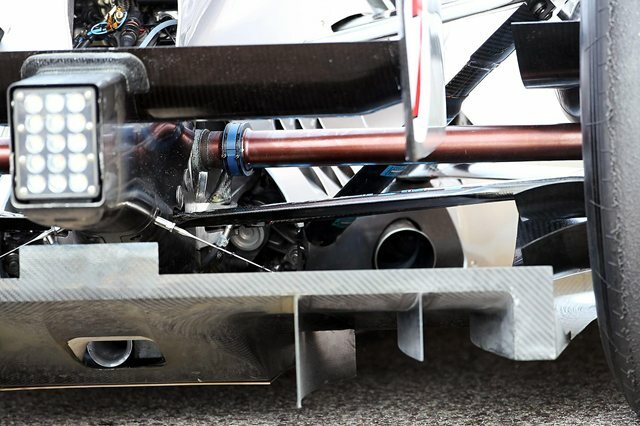 Ducts like these are activated by air speed and so when the car reaches a certain velocity the air moving through the duct to the slots on the rear wing plane reduce drag. If indeed this arrangement was passive then I see no reason that Mercedes having experience with the device couldn't fit it or a similar system to the W03 to reduce drag on straights that DRS is unavailable just as Lotus are looking to do with their DDRS system. The slot and ridges are formed in the central 15cm free zone that allows for the DRS pylons etc and so should still be legal under the 2012 regulations. This year was the first year proper for Mercedes as a team and with a car designed with Nico and Michael in mind. Gone was the controversial blade style roll hoop/airbox in favour of a more conventional one. Even though both Force India and Team Lotus had taken cues from the W01 with their 2011 challengers and ran with blade style hoops. 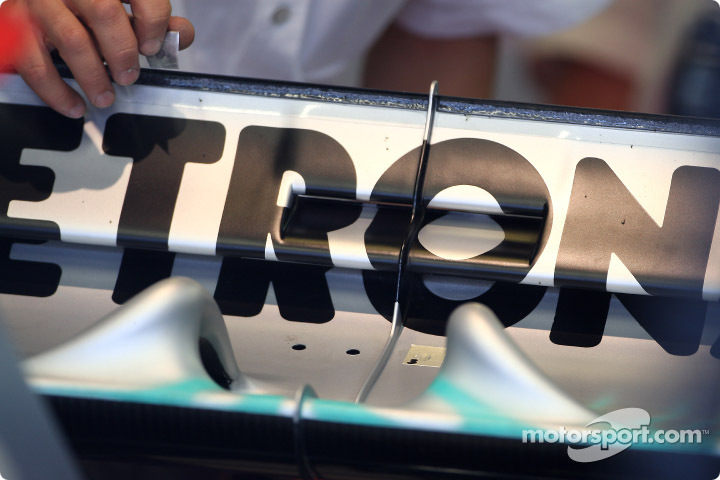 Brawn and the team cited the blade hoop as being part of the compromise of the W01 causing CoG issues. The double decked diffusers of 09/10 were no longer available to the teams in 2011 being banned by the FIA. With DRS taking the place of 2010's F ducts systems in order to reduce drag, the aerodynamics of the car before the rear wing would be paramount. Mercedes unlike most of their competitors positioned their DRS actuators in the endplates leaving the wing planes free of any obstructions or moving parts. Mercedes did however have problems both the actuation of DRS and problems with the wing aerodynamically especially it would seem with Michaels setup. A larger angle of attack chiefly to be blamed with aero balance being affected when DRS was deactivated in the braking phase. As the top plane snapped shut downforce should be restored allowing a stable turn in. However as in aeronautics if you run too high an angle of attack the wing stalls and loses aero efficiency. Both car stance (through suspension setup) and AoA can be blamed for the stall that was occurring, as soon as the wing pitched to the right angle the airflow reattached and downforce is restored. The Sidepods entries were angled inward toward the tub encouraging airflow around the Sidepods. The nosecone took further influence than the W01 from Red Bulls designs with a higher much flatter nose in order to drive more air under the car and even more pronounced ridges running longitudinally around the suspension. What i found strange from the original test car were the sidepod airflow conditoners were very small (vertically) of which my only prognosis was they wanted to get as much more air toward the rear wheels rather than concentrating the flow at the sidepod itself. These were replaced at the last pre season test with more conventional height conditioners. 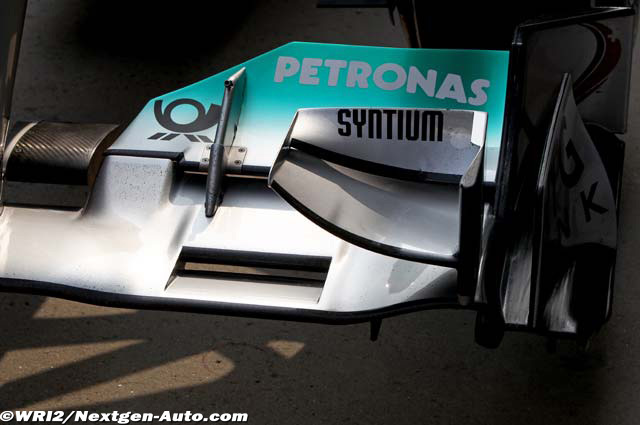 The W02 took the W01's moving wheel base throughout 2010 and decided on a stunted short wheel base. The short wheel base could attribute to some of the issues the team had both with CoG, aerodynamic deficiencies and tyre degradation. With Pirelli re entering the sport and taking over from the out going Bridgestone era the focus for tyre degradation in 2011 was always destined to take a front seat. Tied to this was the FIAs introduction of a weight distribution ruling in which mandates a 46/54 split. This was done so that teams didn't steal a march on another by stumbling across the perfect tyre balance and causing a development war between the teams to find the perfect balance. 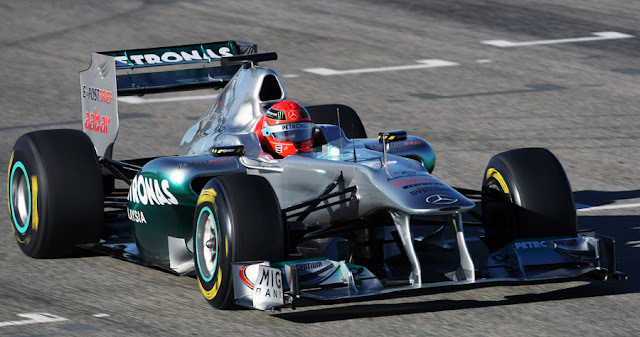 Although the teams had decided to omit KERS from their cars in 2010 it made a triumphant return in 2011 and Mercedes had been working on improving theirs with the system also reduced to around 24kgs. Their original exhaust much like their rivals exited rearward but seemed to pointed further outward toward the wheel/tyre than say Red Bull perhaps in an attempt to seal the diffuser edge. The second version of their exhaust taken to the last pre season test was much further forward, exiting out of the side of the Sidepod encouraging airflow across the floor toward the rear of the car enmass with the airflow already pushing around the side of the Sidepods. The movement of the exhaust further forward could also be in response to their short wheel base. A small vertical strake in front of the wheel helped to navigate the airflow inbound toward the region above the diffuser. It took Mercedes until Valencia to converge on the Red Bull solution who had their exhausts exiting much more rearward and enclosed in a tunnel above the floor to the outside edge of the floor sealing the diffuser much further back and eliminating the effects of tyre squirt (see my tyre squirt article). Even with the FIA curtailing the off throttle effect this remained the most effective way of getting a diffuser sealing effect. Mercedes GP found in 2010 as with the other Mercedes powered cars using the exhaust plume to enhance downforce was unpredictable. This is most likely down to the mapping constraints and general attributes of the Mercedes powerplant in comparison to the Renault, Ferrari and Cosworth power units. With throttle sensitivity and overheating of bodywork all being issues for the Mercedes powered cars. The problem with modern F1 is the lack of testing and the cost implications of taking test parts to the circuit. On the other hand some teams throw caution to the wind and will take more physical parts to a race weekend to test than others. The problem with assessing exhaust plume airflow in simulation is getting the simulation right after all the exhaust is ballistic and changes based on throttle input make using the exhaust plume an aerodynamic advantage by exiting into atmosphere very much a driver controlled entity. Enter Off throttle blowing something not only the Mercedes teams were doing but something that definitely helped those using Mercedes engine to narrow the gap to their rivals. Using off throttle blowing helps to keep a continuous flow over the diffuser, energizing the boundary of the diffuser and helping to draw more air through the diffuser. 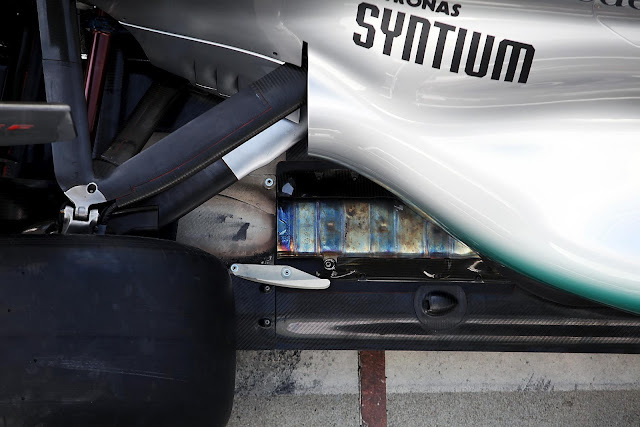 Above: (Top & Middle) shows the solution's Mercedes used to enhance EBD running an exhaust channel on top of the floor at the extremities of the diffuser. (Bottom) Shows the heat treatment added to the exterior of the diffuser to help with heat demand placed on the area by the exhaust position. Mercedes version of EBD ran much shorter on the floor than say the Red Bull variant which may be due to exhaust tuning requirements of the Mercedes engine. Mercedes began their 2012 campaign in quite a strange manner using the W02 at the first test. This allowed the team to correlate tyre data from 2011 with the new Pirelli compounds of 2012. Apart from tyre data, testing with an old car offers little benefit as the new car differed significantly in wheelbase. The WO3 for all in tense and purposes should have sorted most of Mercedes 2011 problems with a years running on the Pirelli tyres, a new simulator and an enhanced team with new members of staff during the design phase of the WO3. The largest innovation at the start of this season came from the Mercedes team in the shape of the Double DRS (DDRS) system. Part of the system had been tested at the end of season test in Abu Dhabi but most passed it off when the drivers complained of difficulties when entering the braking and turning phase. This device then muted the 'W' duct (as the airflow pattern looks like a W) used the driver cooling hole as a method of passively blowing the front wing. Air entering the cooling slot passes down the wing pylons and out of a slot on the underside of the wing. 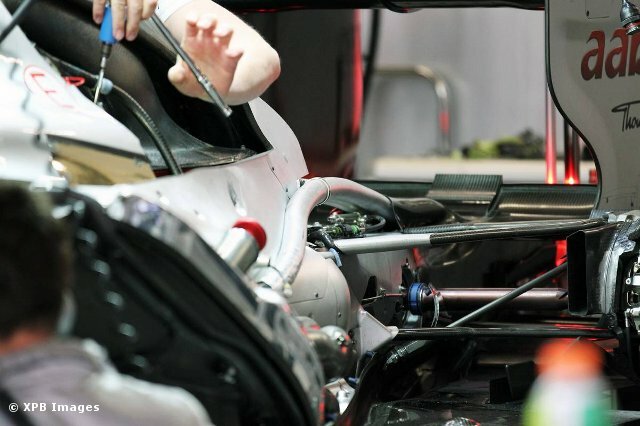 However when this test took place they were using the WO2, for the WO3 the team had also integrated pipes which run the length of the car joining the Front wing with the rear wing meaning that DRS plays a part in the activation of the system in a similar manner to the original F duct concept found on the McLaren etc during 2010. The Lotus team protested DDRS but the system was deemed legal due to the driver not being part of the activation process like the original F ducts demanded and rather the DRS being active or inactive provided the switch for drag reduction. If you have followed my work on Final Sector since the start of the season you may see that I don't fully subscribe to the Mercedes Front wing DDRS function others do. I must add that this is a theory and please feel free to dismiss it over the conventional theory. My theory is based on the slots under the front wing making the wing work when blown. This is based on the assumption that when Mercedes originally tested the 'W' duct it was in order to create additional downforce aswell as reducing drag. Wings can only create so much downforce, this can either be done by dimensionally adding more wing or by increasing the angle of attack. The size of the flaps available to F1 designers is heavily restricted in order to limit the downforce available, they can add gurney flaps but these will add drag and so on the front wing are usually limited in size. Wing angle of attack (AoA) can effect how much downforce is generated but once again at the compromise of drag. I'd guess 15 degrees is about the stalling level of a wing (ie the point at which it won't create additional downforce and stalls) if you were to blow the rear face of the wing you can elevate the wing angle by perhaps another 5 degrees before it stalls. This gives you the advantage of being able to run a higher AoA than if you didn't blow it, resulting in a net increase in downforce. 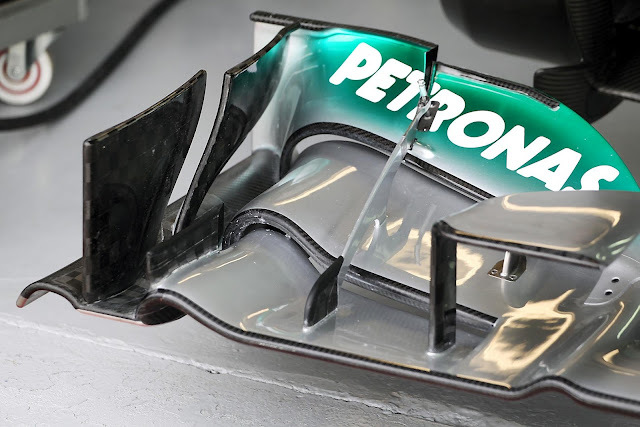 Since Montreal, Mercedes have run their front wing without the cascades which again highlights that they may have been creating too much front end downforce and the cascades creating drag as a net result. (They also changed their wing pylon design to a very McLaren-esque design) I believe the wing from the WO2 with the hole in front of the wing planes paved the way for this, with the designers wanting the air to be forced in behind the main planes to allow a higher AoA. Being able to do this without the need for the through hole would be more efficient. When DRS is deployed the airflow that usually goes down the pylons toward the front wing is sucked/pulled past and sent along the tubing to the rear wing. This has two effects: it augments the airflow around the DRS flap by laterally blowing across the underside of the top wing plane enhancing the DRS effect but more importantly without the blown effect on the underside of the front wing, the wing has too high an AoA and stalls shredding both downforce and drag. Some of Nico's quickest lap times at the start of the season saw him deactivating DRS prior to the braking phase which if my theory is correct would see the front wing becoming blown restoring front end downforce and balance for cornering/braking. Mercedes DDRS is really a qualifying enhancement and if my theory serves correct becomes more of a hamper as the race goes on. This is due to pitch angle, as the fuel burns off during a race the AoA on wings alter ever so slightly which puts the car through an evolution process. 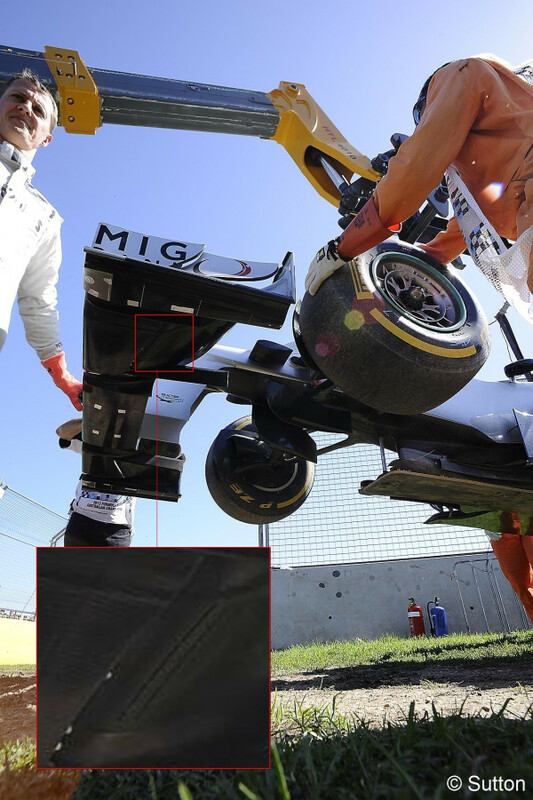 This could be part of the reason for Mercedes tyre struggles (again speculation). 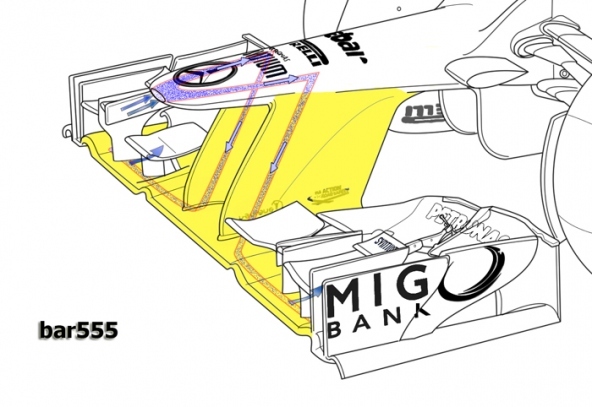 DDRS may have be becoming the WO3's Achilles heel as any upgrades placed on the car will need to be balanced with the aero shift that is created by the device. This however is not the largest problem in play for Mercedes and that more likely stems from the polar opposite of the WO2 with the current car having a very long wheel base. The wheelbase can effect everything from suspension geometry, to tyre wear, to how downforce is created amongst many other things. The WO2 suffered in terms of cooling due to its wheelbase as the Sidepods were too small compromising internal dynamics. 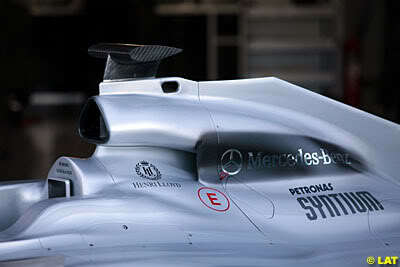 This season the Sidepods are much bulkier to both accommodate the additional cooling requirements and the DDRS tubing. 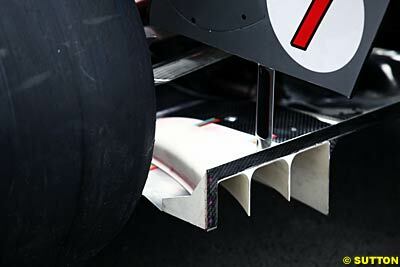 The boundary layer build up along the top surface must be fairly significant due to the length of the Sidepods. However having the exhaust exit on top of the Sidepod will at least enhance the airflow travelling along the top of the sidepod. 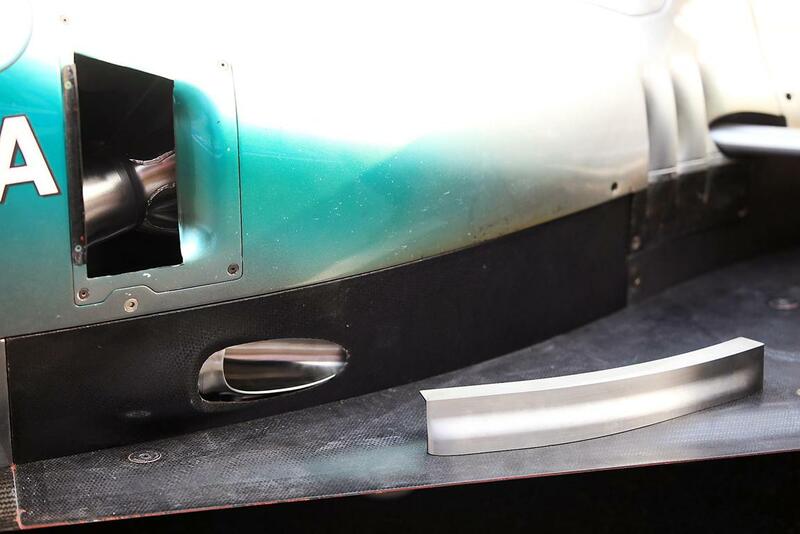 Unlike other teams that use the Coanda style exhaust positions and have adopted the vortex generator fins on top of the Sidepod Mercedes don't need these as the airflow doesn't need to be destabilized or guided in a downwash effect as the Sidepod remains fairly high to the rear. Mercedes haven't upgraded their car at the rate of their opposition with their major upgrade package featuring at Monaco: http://finalsector.co.uk/monaco-gp-technical-roundup/ and the race after in Montreal saw the team drop the front wing cascades most likely in response of balancing the upgrades from Monaco. Mercedes have a difficult decision to make with now only 9 races of the season left, unlike their counterparts Mercedes have stood firm in their design ethos whilst others have converged on very similar exhaust design paths. This is something that the team did in 2011 too leaving them trailing to their rivals. They claim that by not adding upgrades they can better understand the effects of the Pirelli tyres, this all sounds well and good but whilst you stand still in F1 your are actually moving backwards in comparison to your opposition. Mercedes need to make a decision on where they need to finish this season as upgrades are the only way to stop the like of Williams, Sauber, and Force India overtaking them in the title battle. They could do the same as Honda in 08 and shift focus now to their 2013 contender but this could be at the cost of lucrative FOM money. "In the interests of fairness, we simply said that every department had to lose 40 per cent," said Brawn, something regretfully. "It was as crude as that. We had no other mechanism to go through the company and say, two from here, five from there." A lot of good people were lost in that cull, not necessarily big names, but engineers that were a crucial part of forming a team's backbone, that helped ensure their departments could run with a certain degree of autonomy. The group that was left was not only shellshocked by the cull and the loss of several key working relationships, but had to establish a whole new dynamic. As Ross alludes to here Brawn GP didn't simply lose tea ladies in the cull, the staff lost were integral to the team and meant a total change in philosophy this would then be followed by the introduction of Mercedes who would want processes done their way. Mercedes like Honda before them will be thinking long and hard about their involvement at team level and the rewards team ownership brings. As I have been writing this article word has spread that Mercedes intends to step back from it's team involvement from 2013 onwards which shows that the money men in Stuttgart now realise that just like Renault, F1 can bring success without a having the need for a team. Wow lots of great stuff in here. Good work. 1. My general comment for Mercedes - it is quite unfortunate for such great people and overall, as brand, to have such issues - from the very beginning this team has not had the total approval from the main HQ in Germany - I recall clear reports about senior management people not happy to associate Mercedes with team in F1. They simply wanted something else, like continuation of DTM involvement, etc. 2. About the wing AoA and separation - yes, the 15 degrees is good ballpark number, but that would depend on camber, thickness, etc, so the number can be really different. 2.1 Adding Gurney flap could be really beneficial, if done properly, as researches usually cite very favorable downforce-to-drag ratio. 3. Recent rumors state that the tire issue (overheating) is attributed to the powerful Mercedes engine and its large torque in the middle band, which is visible at Mclaren and Force India, respectively. I'm, however, reluctant to accept that theory, as Mclaren are doing pretty good most of the times with their tires - it's about setup, which leads to #4. 4. One thing is for sure - if you remove the front cascade elements, this means you have got enough front downforce, which further aids your theory (plausible, I'd say). What has been lacking for them, IMHO is braking balance and proper pitch sensitivity (the case with Ferrari earlier this year). 5. It will be somewhat sad to see that team out of F1, really. This site really helps the casual fans to understand the aspect of technical sport. My fleet maintenance manager really informed well.